By about 9:00 a.m. I had looped back around to Orinda and thought I deserved a coffee break. I had a free drink coupon from Peet’s and figured there must be a Peet’s in Orinda. I was right. And my animal-themed ride continued as I pulled up and saw the absolute cutest golden retriever puppy sitting between a couple on the bench out front of the coffee shop. They seemed a little bewildered by all the attention they were getting – basically every person who passed by stopped and said, “That’s the cutest puppy ever!” – so I didn’t take a picture. But what do you expect when you bring your ridiculously adorable puppy to a coffee shop on a Sunday morning? 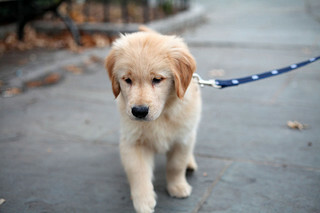 Here’s a photo from Flickr of a similarly cute puppy. From Orinda, I pedaled back towards Oakland and prepared to tackle Pinehurst, a steep and winding ascent that I haven’t done in approximately 10 years. I don’t know why, but I think of Pinehurst as the most difficult hill in the Oakland/East Bay hills. Perhaps it’s because, in earlier days, I would ride up it in the afternoon when it was really hot as well as steep. Whatever the reason, I was feeling intimidated about revisiting this climb after so long. 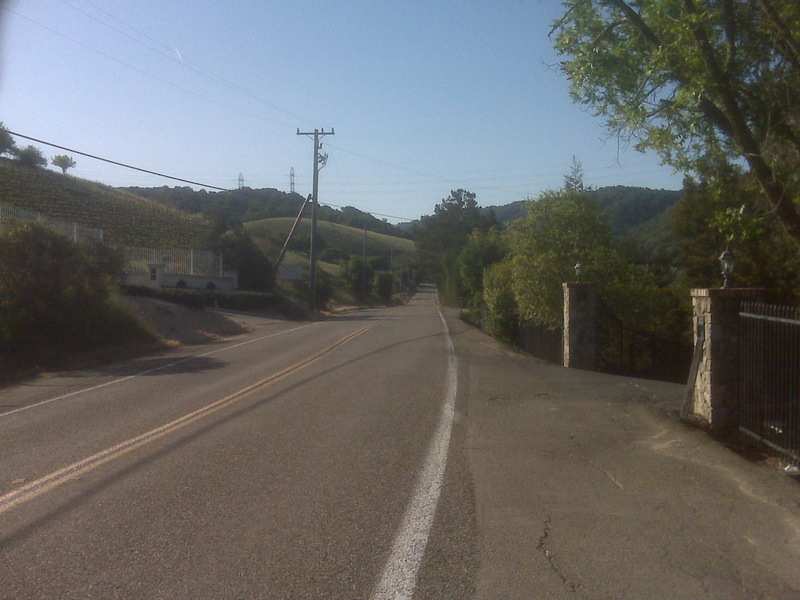 After a lovely pedal through Canyon – the smallest incorporated community in California – I started up. And up. But actually, it wasn’t as bad as I remembered! Turning a corner on a particularly steep section, I saw the signpost for Skyline Boulevard, which signaled the end of the climb. So I cranked out the last few minutes and at the top, scarfed down the rest of my trail mix. Only a few more miles to get home, but quite a mental hurdle to clear. And a wonderful way to start my day. 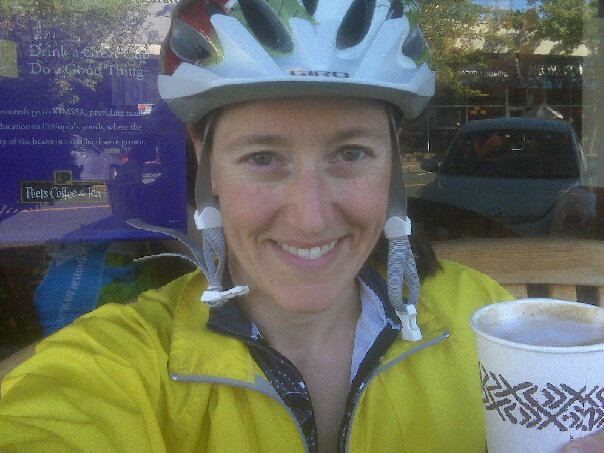 This past Sunday I again hustled out the door early, this time on my bike by 6:00 a.m. My plan was to do a one-way ride ending at the West Dublin BART station, and I had received some grumbling about the additional time involved in a BART ride home. So just the Modern Love column and then out the door I went. About five minutes from home, I realized I had forgotten to grab my transit pass to pay for the BART fare. But, I had some money along, so I wasn’t too worried. About 30 minutes from home, partway up Tunnel Road, I realized I had forgotten my maps. All four maps I had considered bringing (the route crossed onto two different maps in both my sets of bike maps) were sitting on the kitchen counter. Oops. Thanks to my phone, I found my way through the ‘burbs to Palomares Road! 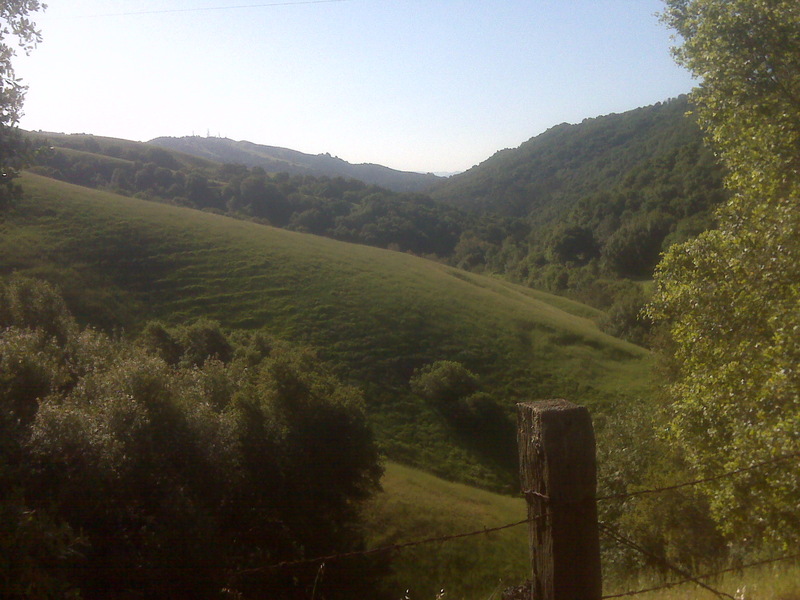 I was aiming for Palomares Canyon, another beautiful and remote climb that I hadn’t pedaled for about ten years. The night before, I’d looked very closely at most of the route, but the urban section through Castro Valley seemed to complicated to memorize, so I figured I’d lean heavily on the map for that stretch. So much for that plan! After about two hours I arrived in Castro Valley and pulled out the phone to see if Google Maps could help me out. I happened to have stopped right at the first turn, and thanks to the Map app, I charted my way to Palomares Road. Unfortunately, no Peet’s on East Castro Valley Boulevard, but a Safeway offered a bathroom break and a yogurt snack. In about fifteen minutes I had made my way past the freeway onramps and was heading into the rural parts of Alameda County. Once on Palomares, there was only one way to go, and it was UP. I think this is actually more difficult than Pinehurst! But also incredibly beautiful. The view from the crest. I took a photo at the top before rolling downhill to the VERY SCARY Niles Canyon Road. Note to self: do not ride on Niles Canyon Road, also known as CA 84, and check a more updated bike map to see if they have eliminated the dotted green line that signals “bike route.” It is not a bike route. After several terrifying miles with no shoulder and 50 mph traffic, I made it to Sunol and escaped the semi-freeway. There, I intersected with a century ride and was suddenly surrounded by other people on bikes in the now-super-hot morning sun. One rider who passed me said he was about half-way through his century. Lucky for me, I was just about fifteen minutes away from the BART station and the end of my ride. With temperatures reaching into the 80’s already, I had sucked down nearly all of the two liters of water I brought. It took a little while to navigate the massive industrial park that surrounds the entrance to the West Dublin BART station, but I finally found the pedestrian overpass near Safeway’s corporate headquarters and parking structure. Clearly, this is not a station oriented towards people who walk and bike. After a peaceful morning on quiet country roads, I spent twenty minutes listening to the freeway traffic whirring by on either side while I waited for the train. SF Giants fans had already taken all the seats at the first station so I stretched during the 40 minute trip back to Oakland. And I got home just in time to shower before A woke up from her nap, which somewhat pacified the other parent. Success!